Many years ago, back when I was in 7th grade, we celebrated the first Earth Day. It wasn’t an overly raucous celebration- just a bunch of kids wearing blue pants and white sneakers, but it was still an opportunity to go against the “establishment.” You see, I went to a catholic school where our uniform consisted of white shirts with a green tie and green pants. Sneakers were allowed only in gym. At that time most of us had never really considered the negative impact of man on our natural world. We routinely changed the oil in our cars and dumped it down the storm drain. The town where I lived would spray the trees and the parks with a bug killer that was most certainly toxic. We used the open window of the car as our garbage bag. As we have gotten older and wiser we have awoke to the needs of our environment. Recycling has gained great popularity and we even recycle our used computer and other electronic devices. We learned about the devastating effects of DDT and how it can kill organisms by interfering with the plasma membrane of microorganisms. Although affected by DDT, the microorganisms do not usually die. In fact, they tend to keep the DDT within themselves and considering that microorganisms such as green algae and plankton form the basis of the food chain, a whole bunch of other life forms were affected this. Despite this newer emphasis on being “green” recycling has been around for quite a long time. Every time you borrow a book from the library and return it for someone else, you are recycling. If you buy a book and donate it to the library to resell or loan, you are helping in an age old practice. The newer trend of eBooks also helps us with being a little bit greener although continuing and improving our print collections remains a priority. CCLD has no plans to get rid of print materials we’re just evolving to meet patron needs. Since ancient times, (or example excavations at Ugarit in Syria have revealed a palace library, temple library, and two private libraries which date back to around 1200 BC, containing diplomatic texts as well as poetry and other literary forms), we have learned that readers like choices. The act of reading is most important in itself, not how you obtain the book. No matter what your preference, CCLD is here to help. In the 119 years since the founding of our first branch, we’ve been recycling books and don’t intend to stop now. My reading has been pretty eclectic this month. 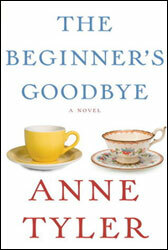 Anne Tyler put out a new book called The Beginner’s Goodbye and I grabbed it up as soon as it came in, as she is my very favorite fiction author. It was wonderful. She only puts out a book every few years and it shows: thoughtful, memorable, beautiful writing. I had been meaning to read Roger Rosenblatt’s memoir, Making Toast for some time and finally got around to it (and was very glad I did). It is another thoughtful, well written book; a nonfiction this time – call number 306.8745 R813. You might remember him from Jim Lehrer’s PBS NewsHour show. Against wind and tide : letters and journals, 1947-1986. Now that I look at those choices, I have to admit they aren’t so eclectic after all; they are all about dealing with what life throws at us. That’s all for this month but don’t forget to stop by the Steele Memorial Library’s gardening books display on the second floor or peruse the Dewey number 635 (gardening section) in new books on the first floor, or the regular shelves on the second floor. I think we have everything about gardening covered. Landscaping is in the 712 section which has always seemed odd to me as they are often about the same subject.